A high-profile site near the mouth of the Miami River downtown may finally be opened to the public as part of an extended riverwalk. The additional riverwalk would be temporary, for perhaps one year, while the property’s new owner lines up permits and other approvals needed to build a luxury residential condo building. Once construction begins, the site would be closed off again for safety and liability reasons. The owner-developer, from Argentina, would have to include a complete and permanent riverwalk along the water’s edge as required by the city code. An application for a temporary riverwalk, and a second and final extension of time for an existing temporary sales center, were considered recently by the Urban Infill and Greenways Subcommittee of the Miami River Commission. The commission says the so-called temporary building on the east end of the property is the former sales center for EPIC Residences & Hotel, a luxury high-rise condominium development built next door on the site of the former Dupont Plaza. The city’s improved riverwalk, which extends from the shore of Biscayne Bay and Bayfront Park around the corner and westward along the north bank of the river, ends abruptly at the old sales center building. 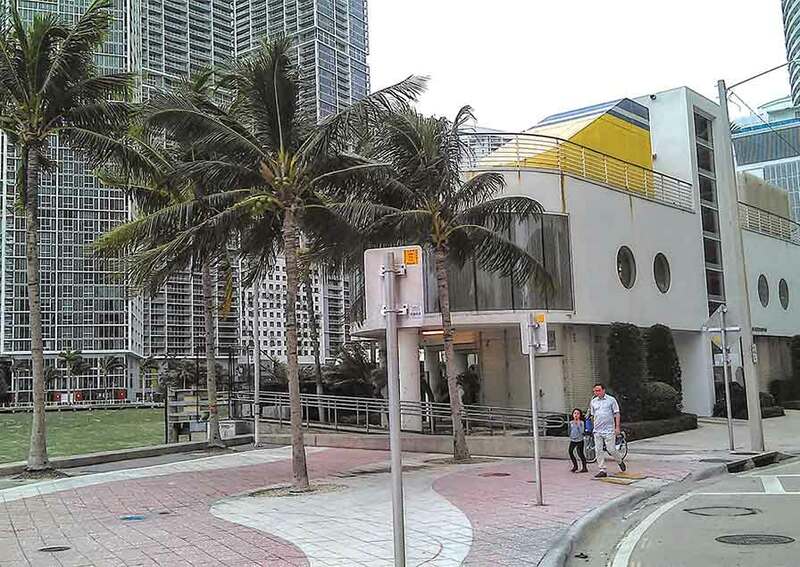 The City of Miami found the three-story nautical themed structure in violation of the city charter and zoning code waterfront development setback requirements years ago and ordered that the building be demolished, according to river commission officials. This occurred under a different owner. The parcel changed hands last summer, when Riverwalk East Developments LLC bought the 1.25-acre site for $125 million, a record for a property of that size in South Florida, according to broker CBRE. CBRE began marketing the property in April 2014, and in a press release called the parcel downtown Miami’s “last vacant waterfront site.” The sale was announced in July. Committee Chairman Ernie Martin said the river commission had an “ambivalent relationship” with the previous property owner, who did not remove the temporary building when ordered. The continued existence of the structure “blocks the continuity” of the city’s growing and beautiful riverwalk, said Dr. Martin. In the years since the first portion of the riverwalk was built, downtown’s population has soared, he said. The river commission continues to push for extension of the riverwalk to keep public access to the river guaranteed and protected, according to Dr. Martin. The overall goal of the riverwalk is to extend a public pathway from Biscayne Bay west and northwestward to an area near Miami International Airport, on both sides of the river. “We’re about halfway there but we have significant gaps,” Dr. Martin said. One of the most notable is on this site, at 250-300 Biscayne Boulevard Way, he said. Iris Escarra, an attorney representing the new owner-developer, said Riverwalk East Developments intends to have a temporary riverwalk installed on the site until it gets the master permit to build the condo tower. “It’s a temporary solution,” she said. Once construction begins, the site would be closed off again to the public until the project is completed. Ms. Escarra estimated that much of 2016 would be taken up by planning, design and the process of obtaining all of the permits and permissions needed for development. Full construction might not begin until 2017. Because owners still want to use the building as a sales center for the new project, they want to keep it until the west-to-east construction work forces its removal. She anticipated the building would be removed between June and December 2018. Horacio Stuart Aguirre, river commission chair, had suggested a request for extending the life of the temporary structure by just one more year, conditioned on a specific date when it would be removed and that money for demolition be held in escrow. Ms. Escarra said she would discuss those items with the developer. “We need to define what temporary is,” said Dr. Martin. Dr. Martin was pleased to see movement that will eventually open the riverbank to an extended public riverwalk. “This is a welcomed, long-awaited occurrence,” he said. The application for a temporary riverwalk, and a second and final extension of time for the old sales center, is to come before the full river commission in 2016. Ms. Escarra said the new owner-developer is excited about building the real riverwalk as part of the final build-out of the site. Dr. Martin noted the high price the developer was willing to pay for the property. “They are believers in the mouth of the river,” Ms. Escarra said. The walkway along the Miami River is supposed to be open to the public. Dr Martin has been a tireless advocate.